Following yesterday evening’s news that the next game in the Professor Layton series will hit Japan on July 20, publisher Level-5 has now revealed that the new game starring the professor’s daughter will be available worldwide that very day—on iOS and Android, but not Nintendo 3DS. 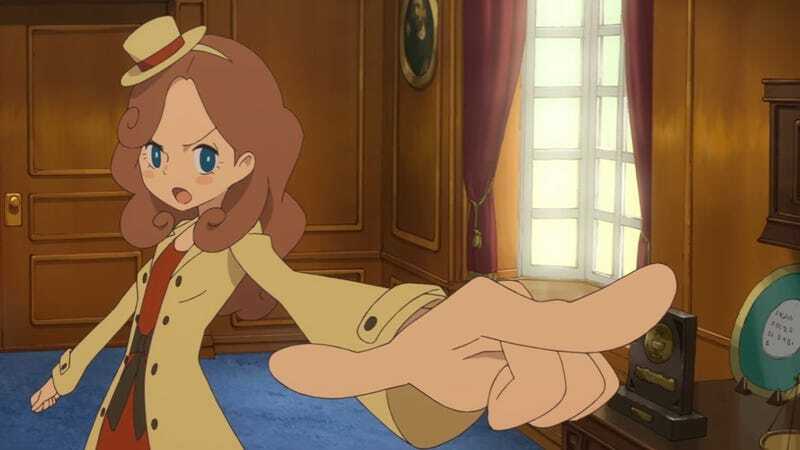 Layton’s Mystery Journey: Katrielle and the Millionaire’s Conspiracy, formerly titled Lady Layton, is a direct follow-up to the successful logic-puzzle-solving, story-based, point-and-click adventure series that has sold 16 million copies worldwide for the Nintendo DS and 3DS systems. So far, the games have been published by Level-5 in Japan and by Nintendo in the West. While Mystery Journey will indeed come to the Nintendo 3DS in Japan on July 20, it won’t be on Nintendo’s platform in the West at launch. Level-5's announcement says that the 3DS version will be localized at some time after launch, so if you’re really hungry for a new Layton (and why wouldn’t you be, since it’s been over three years since the last brilliant entry) and don’t speak Japanese, you may want to consider playing on your smartphone instead. The iOS and Android versions of the game will be released worldwide on July 20 in eight different languages, Level-5 said: English, French, Italian, Spanish, German, Dutch, Korean, and Japanese. Don’t worry, the mobile game isn’t like that weird not-really-a-Layton spinoff Layton Brothers. From all appearances, the gameplay of Mystery Journey is identical to the DS games you know and love, just played with your finger instead of a stylus. The Professor himself may have retired from action, but his daughter Katrielle is taking up the mantle of searching quaint European hamlets for non sequitur logic puzzles. Kotaku has reached out to Level-5 for an update on when we might expect the 3DS version to leave Japan, but has not heard back yet. As of now, it seems like Layton fans have a decision to make: Wait for the trusty 3DS version, or try it on mobile?